Capture the essence of nature on paper silk and other fabrics. In this workshop you will learn how to extract dyes and prints from the plants in your own Florida landscape. You will leave this workshop with several fabric swatches to use for future reference, beautifully printed and dyed silk scarves and several sheets of printed paper. The instructor will share a wealth of information based on her extensive study and experimentation with local plants as dye sources, and provide you with a list of plants that have given her the best results. You will also learn strategies on how to determine for yourself which species will render lasting colors and how to prepare and mordant fabrics. You will leave with enough information to get you started in the fascinating craft of natural dying. In this six week series learn how to create your own beautiful textiles and upcycle thrift shop garments to create unique wearable art. 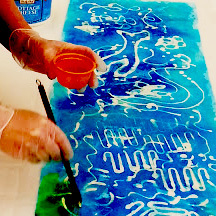 You will be introduced to a variety of ancient and contemporary techniques commonly used by textile artists, including silk painting, shibori dying, batik, silk screening, mono printing, photo transfer, foiling and more. After learning and practicing this variety of techniques, you will be guided and encouraged to combine, layer and improvise the use of your new skills to create your own “Art Cloth” and wearable art. A considerable emphasis in this class will be placed on learning the proper use of professional quality dyes and pigments to obtain vibrant, colorfast fabrics as you create several unique pieces that you will be thrilled to frame and display in your home or incorporate in your creative projects.. . All Materials provided by the instructor. This workshop is for Students who have already taken Shibori and Silk Painting and would like to delve deeper into the craft of painting with dyes on silk. 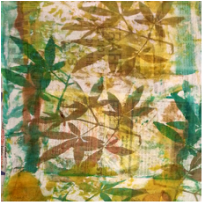 In this workshop the students will learn to work with various resists, silk screens and thickened dyes to obtain more controlled painterly effects and images. They will also have the opportunity to perfect and expand the shibori techniques learned in the previous workshop to obtain a wider range of colors and patterns. This class will be tailored to each student’s goals. All dyes and tools fabric and silk scarves will be provided by the instructor. But students are welcome to bring their own 100% silk fabric and/or garments to up-cycle as well.